June 28, 2012 -At 00:40 the SHFD was dispatched to the area of 490 Route 61 North (in the area of Renninger’s Market) for a house fire. Chief 722 (Donatti) arrived on scene to find a working garage fire impending on a house. Chief 722 immediately advised all incoming units of a working fire and requested a Tanker Task Force. E-732 was the first unit to arrive on scene and immediately placed 2 1 3/4 inch lines into service. E-737 relayed water between E-733 (which was being supplied by tankers) and E-732. Fire personnel knocked down the blaze, extinguished hot spots and conducted overhaul operations. Crews also checked the adjacent structure for any extension and performed ventilation using PPV fans. All SHFD units were on scene for approximately 2.5 hours. Chief 722 had command. June 24, 2012 – At 11:26 Stations 2 & 4 were dispatched to 501 May Drive for a medical assist. Crews arrived on scene and assisted EMS with lifting a patient. All units were then placed available. June 22, 2012 – At 08:14 the Schuylkill Haven Fire Department was dispatched to the intersection of Route 61 and Earl Streets for a vehicle accident with entrapment involving a tractor trailer. Crews arrived on scene and found a car had struck a tractor trailer puncturing the trucks saddle tank spilling fuel onto the roadway and into a storm drain. Fire personnel worked quickly to secure the leak and protect the storm drain. FireFighters also assisted EMS with 1 patient. All SHFD units were on scene for approximately 6 hours until a specialized Haz-Mat Team arrived to clean the roadway. Chief 720 (Sattizahn) had command. June 19, 2012 – At 23:13 Station 1 was dispatched to 19 Elmer Avenue, Cressona Borough for a vehicle accident with entrapment. Fire personnel arrived on scene to find a single car accident with injuries. More info to follow. June 19, 2012 – At 00:08 Stations 1 & 2 were dispatched to the area of 199 Dock Street for a vehicle accident with injuries. Crews arrived on scene to find a vehicle accident involving a parked car. Crews applied floor dry to the area around the vehicles and remained on scene until the tow company arrived. Chief 720 had command. 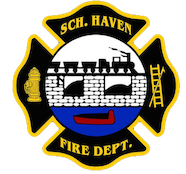 June 18, 2012 – At 15:21 the Schuylkill Haven Fire Department was dispatched to 1 Manheim Road for a motor vehicle accident with injuries. Crews arrived on scene and found a 2 car accident with minor injuries. Fire personnel secured the vehicles and assisted EMS with the care of 2 patients. All units were on scene for approximately 1 hour until the tow company arrived. June 10, 2012 -At 19:00 the Schuylkill Haven Fire Department was dispatched to 1476 Route 61 South for a reported commercial fire. Station 2 laid 5-ich across the parking lot of the Aldi’s supermarket and a 1 3/4 was immediately placed into service knocking down the bulk of the fire. Station1 & 4 were in charge of ventilation and evacuation of the hotel. All Schuylkill Haven units were on scene for approximately 1.5 hours. Chief 723 Motko had command. June 9, 2012 – At 23:37 Stations 1 & 2 were dispatched to 625 East Main Street, the Schuylkill Haven Area High School to setup a landing zone for incoming Medevac 7. Fire personnel established a secure area for the “bird” to land and assisted EMS and the Flight Crew with patient transport. All units cleared the scene shortly after take-off. Chief 722 had command. June 8, 2012 – At 04:03 the SHFD was dispatched to 43 St. John Street, for an automatic fire alarm. All units were advised of a false activation by SCCC and cancelled.